Every new technology is faced with skepticism till its real value is discovered and understood. This trend has been more significant in the last few years, as users became more aware and started treating data privacy and security as a key issue with regards to any technology. This concern is further heightened when it comes to mobile technologies, such as iBeacon. iBeacon technology is based on the fundamental idea of delivering location-specific, contextual and timely mobile experiences to customers. Given how iBeacon technology works, users are very guarded about sharing their location and privacy information; this has turned out to be one of the biggest obstacles for brands and businesses involved in scaling beacon-based solutions. In this post, we will discuss how businesses can go about busting the top beacon security and privacy myths and the best practices that can be followed in order to build customer trust and confidence. 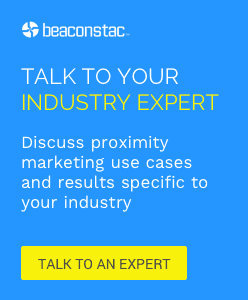 Beacons do not transmit any personal user data. In fact, beacons are just low-cost hardware transmitters that only broadcast their individual UUID, major and minor values. This information is then received by the concerned mobile app (that is associated with the beacon) to process the information and trigger an appropriate notification to app users in the range of the beacon. Beacons by themselves do not track exact user location. All a beacon does is to notify that your phone is nearby. The concerned beacon-enabled app can then translate this information into a geographical location (such as latitude and longitude) by using a mapping solution or GPS. There is also another false belief that iBeacon technology tracks every mobile phone in the range of a beacon. This is not true; in order for a beacon-enabled app to know your location (or your phone’s location), you should have explicitly opted-in for background location tracking. To better understand beacon interactions, we can compare it to the traditional web-based analytics we encounter on computers. Beacon analytics platforms essentially track device, location information and app interactions under an anonymous ID, thus not resulting in any breach of privacy and security. We have discussed other beacon security concerns from both customers and business standpoints in an earlier blog. It is essential that beacon-based apps are very clear and upfront about the reason behind collecting location/user information. It is very important that your app relieves the privacy and security concerns of your customers and this is best achieved when it is integrated into your app’s UX. Instead of using a standard location permission notification, your app should clearly communicate why and how it uses location information. Below is an example of how Apple Stores communicate the need for location information as part of their app’s UX. Like we stated earlier, the power to share personal information should purely rest in the hands of your customers. To ensure this, it is very essential to allow customers the opportunity to opt out of data sharing at any point in time. By opting out, customers can also choose to delete all existing customer information stored on your servers as well. This is similar to the email unsubscribe feature that most of us are familiar with. Delivering strong data driven app experiences is one of the best ways to ensure customer confidence. This also ensures acceptance towards data sharing and privacy. The customer insights and information gathered needs to be well processed and analysed in order to deliver highly personalized and relevant app experiences. For example, sending location-based promotional notifications in a retail store based on the customer segment, past purchase history and app browsing history is a good way to ensure a personalized app experience. This way, when customers receive notifications that they are actually interested in, they will be more willing to share personal information. Spamming or bombarding customers with irrelevant messages is a huge threat to ensuring customer loyalty. Doing so leads to destroying the original value proposition created by the app. App developers and marketers should keep in mind that the choice of providing personal information is entirely up to the customers and delivering annoying messages can lead to them opting out of such data sharing or even uninstalling the app. An interesting report on push notifications by analytics company, Localytics, stated that the top three responses on the type of push notification preferred by customers had one theme in common – personalization. The results of the survey stated that 48% like to receive special offers based on personal preferences, 35% like to receive new content based on personal preferences and 34% like to receive special offers based on location. iBeacon technology can prove to be a huge advantage in delivering such personalized, location-specific notifications. Beacon-based apps should not only control the quality of the content but also the frequency at which notifications are broadcasted to customers. Frequency-based rules can be employed to measure and limit the number of notifications sent to customers. According to the same report by Localytics mentioned earlier, receiving around 2 to 5 messages in a week would cause 46% of respondents to disable push notifications and 32% of respondents said that they would stop using the app altogether if they received between 6 to 10 messages in a week’s time. Thus, beacon-based apps should test and analyse the optimum number of notifications that would work best for its business. In conclusion, for customers to trust a brand and share their privacy and location information, the app should tirelessly focus on meeting customer expectations and delivering valuable mobile experiences. In addition, apps should not only focus on meeting business goals, like, providing tailored offers and promotions, but also providing information that the customer actually needs, like wayfinding support at an event or boarding/flight details at an airport.